True to the spirit of a great Disney classic, this extraordinary film bursts with music and adventure from Just Around the Riverbend, and now, for the first time, witness it all in high definition on Blu-ray. Along the edgewaters of Virginia, Pocahontas, the free-spirited daughter of Chief Powhatan, watches as a mysterious shipload of English settlers arrives, led by the greedy Governor Ratcliffe and the courageous Captain John Smith. Along with her playful pals, Meeko, a mischievous raccoon, and feisty hummingbird, Flit, Pocahontas develops a strong friendship with Captain Smith. But when tensions mount between their two very different cultures, Pocahontas seeks the lively wisdom of Grandmother Willow to help her find a way for everyone to live together in peace. 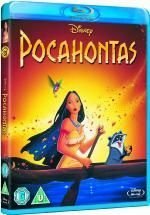 Winner of two Academy Awards (1995) for Best Song (Colours Of The Wind) and Best Musical Score, Pocahontas surrounds you with the riches of another glowing winner in Disneys animated hit parade!